Source: New Introductory Lectures on Psycho-analysis (1933) publ. Hogarth Press. With regard to the two alternatives - that the ego and the super-ego may themselves be unconscious, or that they may merely give rise to unconscious effects - we have for good reasons decided in favour of the former. Certainly, large portions of the ego and super-ego can remain unconscious are, in fact, normally unconscious. That means to say that the individual knows nothing of their contents and that it requires an expenditure of effort to make him conscious of them. 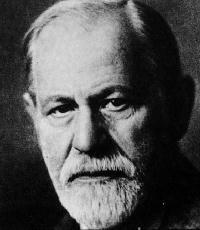 It is true, then, that ego and conscious, repressed and unconscious do not coincide. We are forced fundamentally to revise our attitude towards the problem of conscious and unconscious. At first we might be inclined to think very much less of the importance of consciousness as a criterion, since it has proved so untrustworthy. But if we did so, we should be wrong. It is the same with life: it is not worth much, but it is all that we have. Without the light shed by the quality of consciousness we should be lost in the darkness of depth-psychology. Nevertheless we must try to orientate ourselves anew. What is meant by 'conscious', we need not discuss; it is beyond all doubt. The oldest and best meaning of the word 'unconscious' is the descriptive one; we call 'unconscious' any mental process the existence of which we are obliged to assume-because, for instance, we infer it in some way from its effects but of which we are not directly aware. We have the same relation to that mental process as we have to a mental process in another person except that it belongs to ourselves. If we want to be more accurate, we should modify the statement by saying that we call a process 'unconscious' when we have to assume that it was active at a certain time, although at that time we knew nothing about it. This restriction reminds us that most conscious processes are conscious only for a short period; quite soon they become latent, though they can easily become conscious again. We could also say that they had become unconscious, if we were certain that they were still something mental when they were in the latent condition. So far we should have learnt nothing, and not even have earned the right to introduce the notion of the unconscious into psychology. But now we come across a new fact which we can already observe in the case of errors. We find that, in order to explain a slip of the tongue, for instance, we are obliged to assume that an intention to say some particular thing had formed itself in the mind of the person who made the slip. We can infer it with certainty from the occurrence of the speech-disturbance, but it was not able to obtain expression; it was, that is to say, unconscious. If we subsequently bring the intention to the speaker's notice, he may recognise it as a familiar one, in which case it was only temporarily unconscious, or he may repudiate it as foreign to him, in which case it was permanently unconscious. Such an observation as this justifies us in also regarding what we have called 'latent' as something 'unconscious'. The consideration of these dynamic relations puts us in a position to distinguish two kinds of unconscious: one which is transformed into conscious material easily and under conditions which frequently arise, and another in the case of which frequently arise, and another in the case of which such a transformation is difficult, can only come about with a considerable expenditure of energy, or may never occur at all. In order to avoid any ambiguity as to whether we are referring to the one or the other unconscious, whether we are using the word in the descriptive or dynamic sense, we make use of a legitimate and simple expedient. We call the unconscious which is only latent, and so can easily become 'conscious', the 'pre-conscious', and keep the name 'unconscious' for the other. We have now three terms 'conscious', 'preconscious', and 'unconscious', to serve our purposes in describing mental phenomena. Once again, from a purely descriptive point of view, the 'preconscious' is also unconscious, but we do not give it that name, except when we are speaking loosely, or when we have to defend in general the existence of unconscious processes in mental life. You will, I hope, grant that so far things are not so bad and that the scheme is a convenient one. That is all very well; unfortunately our psychoanalytic work has compelled us to use the word 'unconscious' in yet another, third, sense; and this may very well have given rise to confusion. 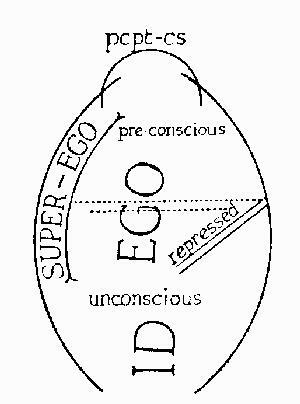 Psychoanalysis- has impressed us very strongly with the new idea that large and important regions of the mind are normally removed from the knowledge of the ego, so that the processes which occur in them must be recognised-as unconscious in the true dynamic sense of the term. We have consequently also attributed to the word 'unconscious' a topographical or systematic meaning; we have talked of systems of the preconscious and of the unconscious, and of a conflict between the ego and the Ucs system; so that the word 'unconscious' has more and more been made to mean a mental province rather than a quality which mental things have. At this point, the discovery, inconvenient at first sight, that parts of the ego, too, are unconscious in the ego and super-ego, too, are unconscious in the dynamic sense, has a facilitating effect and enables us to remove a complication. We evidently have no right to call that region of the mind which is neither ego not super-ego the Ucs system, since the character of unconsciousness is no t exclusive to it. Very well; we will no longer use the word 'unconscious' in the sense of a system, and to what we have hitherto called by that name we will give a better one, which will not give rise to misunderstanding. Borrowing, at G. Groddeck's suggestion, a term used by Nietzsche, we will call it henceforward the 'id'. This impersonal pronoun seems particularly suited to express the essential character of this province of the mind-the character of being foreign to the ego. Super-ego, ego and id, then, are the three realms, regions or provinces into which we divide the mental apparatus of the individual; and it is their mutual relations with which we shall be concerned in what follows. You must not expect me to tell you much that is new about the id except its name. It is the obscure inaccessible part of our personality; the little we know about it we have learnt from the study of dream-work and the formation of neurotic symptoms, and most of that is of a negative character, and can only be described as being all that the ego is not. We can come nearer to the id with images, and call it chaos, a cauldron of seething excitement. We suppose that it is somewhere in direct contact with somatic processes, and takes over from them instinctual needs and gives them mental expression, but we cannot say in what substratum this contact is made. These instincts fill it with energy, but it has no organisation and no unified will, only an impulsion to obtain satisfaction for the instinctual needs, in accordance with the pleasure-principle. The laws of logic - above all, the law of contradiction - do not hold for processes in the id. Contradictory impulses exist side by side without neutralising each other or drawing apart; at most they combine in compromise-formations under the overpowering economic pressure towards discharging their energy. There is nothing in the id which can be compared to negation, and we are astonished to find in it an exception to the philosophers' assertion that space and time are necessary forms of our mental acts. In the id there is nothing corresponding to the idea of time, no recognition of the passage of time, and (a thing which is very remarkable and awaits adequate attention in philosophic thought) no alteration of mental processes by the passage of time. Conative impulses which have never got beyond the id, and even impressions which have been pushed down into the id by repression, are virtually immortal and are preserved for whole decades as though they had only recently occurred. They can only be recognised as belonging to the past, deprived of their significance, and robbed of their charge of energy, after they have been made conscious by the work of analysis, and no small part of the therapeutic effect of analytic treatment rests upon this fact. It is constantly being borne in upon me that we have made far too little use for our theory of the indubitable fact that the repressed remains unaltered -by the passage of time. This seems to offer us the possibility of an approach to some really profound truths. But I myself have made no further progress here. Naturally, the id knows no values, no good and evil, no morality. The economic, or, if you prefer, the quantitative factor, which is so closely bound up with the pleasure dominates all its processes. Instinctual cathexes seeking discharge, - that, in our view, is all that the id contains. It seems, indeed, as if the energy of these instinctual impulses is in a different condition from that in which it is found in the other regions of the mind. It must be far more fluid and more capable of being discharged, for otherwise we should not have those displacements and condensations, which are so characteristic of the id and which are so completely independent of the qualities of what is cathected. (In the ego we should call it an idea.) What would one not give to understand these things better? You observe, in any case, that we can attribute to the id other characteristics than that of being unconscious, and you are aware of the possibility that parts of the ego and super-ego are unconscious without possessing the same primitive and irrational quality. As regards a characterisation of the ego, in so far as it is to be distinguished from the id and the super-ego, we shall get on better if we turn our attention to the relation between it and the most superficial portion of the mental apparatus,, which we call the Pcpt-cs (perceptual-conscious) system. This system is directed on to the external world, it mediates perceptions of it, and in it is generated, while it is functioning, the phenomenon of consciousness. It is the sense-organ of the whole apparatus, receptive, moreover, not only of excitations from without but also of such as proceed from the interior of the mind. One can hardly go wrong in regarding the ego as that part of the id which has been modified by its proximity to the external world and the influence that the latter has had on it, and which serves the purpose of receiving stimuli and protecting the organism from them, like the cortical layer with which a particle of living substance surrounds itself. This relation to the external world is decisive for the ego. The ego has taken over the task of representing the external world for the id, blindly striving to gratify its instincts in complete disregard of the superior strength of outside forces, could not otherwise escape annihilation. In the fulfilment of this function, the ego has to observe the external world and preserve a true picture of it in the memory traces left by its perceptions, and, by means of the reality-test, it has to eliminate any element, in this picture of the external world which is a contribution from internal sources of excitation. On behalf of the id, the ego controls the paths of access to motility, but it interpolates between desire and action the procrastinating factor of thought, during which it makes use of the residues of experience stored up in memory. In this way it dethrones the pleasure-principle, which exerts undisputed sway over the processes in the id, and substitutes for it-the reality-principle, which promises greater security and greater success. The relation to time, too, which is so hard to describe, is communicated to the ego by the perceptual system; indeed it can hardly be doubted that the mode in which this system works is the source of the idea of time. What, however, especially marks the ego out in contradistinction to the id, is a tendency to synthesise its contents, to bring together and unify its mental processes, which is entirely absent from the id. When we come to deal presently with the instincts in mental life, I hope we shall succeed in tracing this fundamental characteristic of the ego to its source. It is this alone that produces that hi h degree of organisation which the ego needs for its highest achievements. The ego advances from the function of perceiving instincts to that of controlling them, but the latter is only achieved through the mental representative of the instinct becoming subordinated to a larger organisation, and finding its place in a coherent unity. In popular language, we may say that the ego stands for reason and circumspection, while the id stands for the untamed passions. So far we have allowed ourselves to dwell on the enumeration of the merits and capabilities of the ego; it is time now to look at the other side of the picture. The ego is after all only a part of the id, a part purposively modified by its proximity to the dangers of reality. From a dynamic point of view it is weak; it borrows its energy from the id, and we are not entirely ignorant of the methods-one might almost call them 'tricks'-by means of which it draws further amounts of energy from the id. Such a method, for example, is the process of identification, whether the object is retained or given up. The object-cathexes proceed from the instinctual demands of the id. The first business of the ego is to take note of them. But by identifying itself with the object, it recommends itself to the id in the place of the object and seeks to attract the libido of the id on to itself. We have already seen that, in the course of a person's life, the ego takes into itself a large number of such precipitates of former object-cathexes. On the whole the ego has to carry out the intentions of the id; it fulfils its duty if it succeeds in creating conditions under which these intentions can best be fulfilled. One might compare the relations of the ego to the id with that between a rider and his horse. The horse provides the locomotive energy, and the rider has the prerogative of determining the goal and of guiding the movements of his powerful mount towards it. But all too often in the relations between the ego and the id we find a picture of the less ideal situation in which the rider is obliged to guide his horse in the direction in which it itself wants to go. The ego has separated itself off from one part of the id by means of repression-resistances. But the barrier of repression does not extend into the id; so that the repressed material merges into the rest of the id. The proverb tells us that one cannot serve two masters at once. The poor ego has a still harder time of it; it has to serve three hash masters, and has to do its best to reconcile the claims and demands of all three. These demands are always divergent and often seem quite incompatible; no wonder that the ego so frequently gives way under its task. The three tyrants are the external world, the super-ego and the id. When one watches the efforts of the ego to satisfy them all, or rather, to obey them all simultaneously, one cannot regret having personified the ego, and established it as a separate being. It feels itself hemmed in on three sides and threatened by three kinds of danger, towards which it reacts by. developing anxiety when it is too hard pressed. Having originated in experiences of the perceptual system, it is designed to represent the demands of the external world, but it also wishes to be a loyal servant of the id, to remain upon good terms with the id, to recommend itself to the id as an object, and to draw the id's libido on to itself. In its attempt to mediate between the id and reality, it is often forced to clothe the Ucs commands of the id with its own Pcs rationalisations, to gloss over the conflicts between the id and reality, and with diplomatic dishonesty to display a pretended regard for reality, even when the id persists in being stubborn and uncompromising. On the other hand, its every movement is watched by the severe super-ego, which holds up certain norms of behaviour, without regard to any difficulties coming from the id and the external world; and if these norms are not acted up to, it punishes the ego with the feelings of tension which manifest themselves as a sense of inferiority and guilt. In this way, goaded on by the id, hemmed in by the super-ego, and rebuffed by reality, the ego struggles to cope with its economic task of reducing the forces and influences which work in it and upon it to some kind of harmony; and we may well understand how it is that we so often cannot repress the cry: 'Life is not easy'. When the ego is forced to acknowledge its weakness, it breaks out into anxiety. Reality anxiety in face of the external world, moral anxiety in face of the super-ego, and neurotic anxiety in face of the strength of the passions in the id. I have represented the structural relations within the mental personality, as I have explained them to you, in a simple diagram, which I here reproduce. You will observe how the super-ego goes down into the id; as the heir to the Oedipus complex it has, after all, intimate connections with the id. It lies further from the perceptual system than the ego. The id only deals with the external world through the medium of the ego, at least in this diagram. It is certainly still too early to say how far the drawing is correct; in one respect I know it is not. The space taken up by the unconscious id ought to be incomparably greater than that given to the ego or to the preconscious. You must, if you please, correct that in your imagination. And now, in concluding this certainly rather exhausting and perhaps not very illuminating account, I must add a warning. When you think of this dividing up of the personality into ego, super-ego and id, you must not imagine sharp dividing lines such as are artificially drawn in the field of political geography. We cannot do justice to the characteristics of the mind by means of linear contours, such as occur in a drawing or in a primitive painting, but we need rather the areas of colour shading off into one another that are to be found in modern pictures. After we have made our separations, we must allow what we have separated to merge again. Do not judge too harshly of a first attempt at picturing a thing so elusive as the human mind. It is very probable that the extent of these differentiations varies very greatly from person to person; it is possible that their function itself may vary, and that they may at times undergo a process of involution. This seems to be particularly true of the most insecure and, from the phylogenetic point of view, the most recent of them, the differentiation between the ego and the super-ego. It is also incontestable that the same thing can come about as a result of mental disease. It can easily be imagined, too, that certain practices of mystics may succeed in upsetting the normal relations between the different regions of the mind, so that, for example, the perceptual system becomes able to grasp relations in the deeper layers of the ego and in the id which would otherwise be inaccessible to it. Whether such a procedure can put one in possession of ultimate truths, from which all good will flow may be safely doubted. All the same, we must admit that the therapeutic efforts of psychoanalysis have chosen much the same method of approach. For their object is to strengthen the ego, to make it more independent of the super-ego, to widen its field of vision, and so to extend its organisation that it can take over new portions of the id. Where id was, there shall ego be. It is reclamation work, like the draining of the Zuyder Zee.